I have dinner! 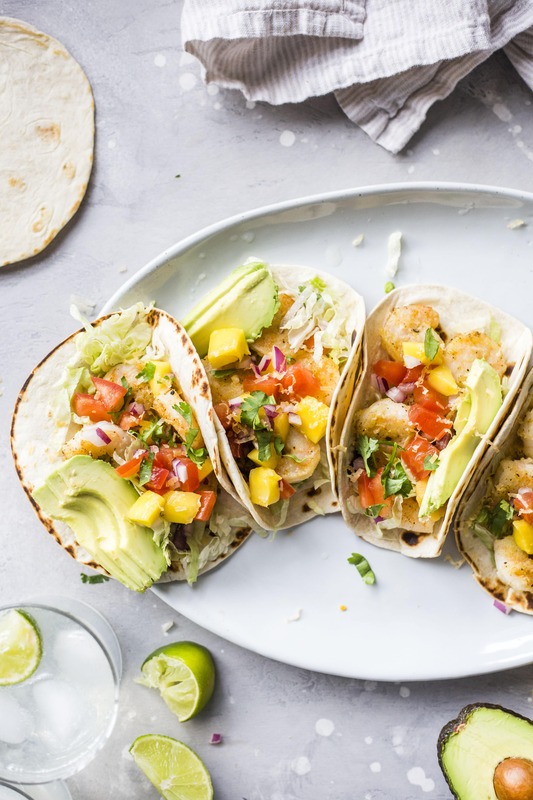 Shrimp tacos, to be exact. And it includes fresh fruit and vegetables, seafood and avocado. Can’t go wrong there, right? Especially if your shrimp is already clean – this meal should take you less than 20 minutes to throw together. I was so excited when I found mangos at my grocery store on sale this week: 10 for $10! Are mangos in season? I have no idea. But I found a squishy, soft one (in my experience those are the best) and also bought a firmer one which I am sure will die in the crisper drawer. I’ll probably find it in May. I knew exactly what was happening to one mango though. It was perfectly ripe and I quickly chopped it with some red onion and tomato – easy, fresh salsa right there. And I’m pretty sure I won’t ever make shrimp another way. With a quick dredge through flour, it comes out so flavorful and crispy. I think I like these better than regular tacos. Maybe even better than pork tacos? Which is wild, considering me and pork are likethis. And they are just so pretty and colorful. I love bright food. Except the vegetable kind. We enjoyed this so much that I’m planning on making it again Friday. It was bursting with more flavor than I ever thought possible. I really loved the crunchy textures of the crispy shrimp and even the shredded lettuce. In fact, I don’t even think I can wait until Friday. Pretty sure I must make these again today. Make sure shrimp is clean and completely dry. Combine salt, pepper, garlic and cumin and sprinkle it over the shrimp. Add the flour to a small bowl, and dredge the shrimp through the flour to get a very light coating on it. Heat a skillet on medium high heat and add the olive oil. Once hot, add the shrimp and brown on each side, about 2-3 minutes per side. Remove the shrimp and let drain on a paper towel. Combine chopped mango, onion and tomato together in a bowl, adding a bit of salt and pepper. 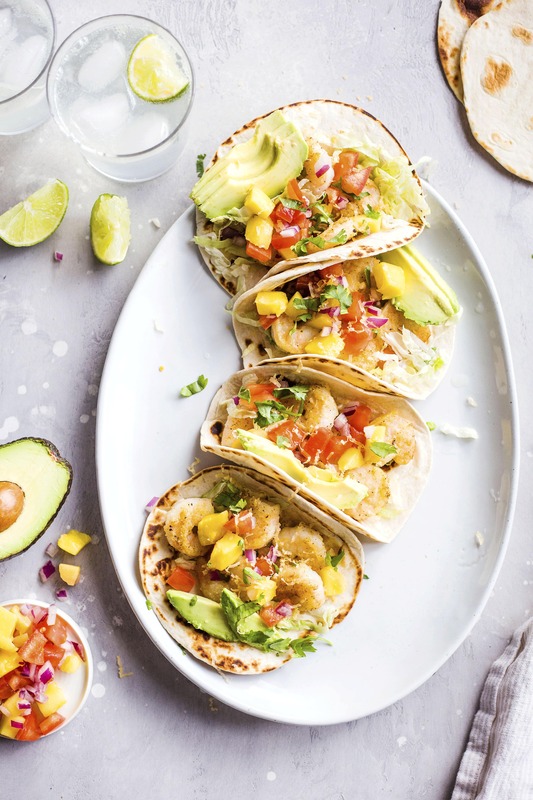 Assemble tacos, adding lettuce, shrimp, mango salsa, avocado, cilantro and cheese. Spritz with lime juice. This is about as veggie-heavy as it’s gonna get around here. I love love your blog! All of your meals look so yummy! I am trying the shrimp tacos this weekend when my parents come in. Thanks for the recipe! I made these tonight and they were WONDERFUL, thank you so much. Made a variation of these for dinner those…and they were soooo good. Thanks for the inspiration! I really don’t remember how I stumbled upon your blog but I am OH SO HAPPY I did! My printer has run out of ink from printing recipe after recipe! I made the shrimp tacos tonight and drove my family nutty bragging on how wonderful they were! Too colorful for their drab palates but they loved the shrimp!! This blog, my friend, (yes, I feel like I know you! ha!) is fabulous!!! I am trying these tonight! Can’t wait! I just wanted to share that I made these on Saturday…and they are SOOOOOOO good that we had them again for dinner tonight! 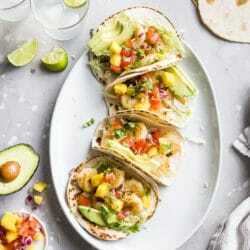 I have tried Shrimp tacos and they are awesome, my family also likes when I make Fish and Pork tacos. We are having a Mexican get together this weekend I will be making all three. Nothing goes better with good food than to make a good Pico de Gallo and fresh salsa. Our friends will be making margaritas….let the fun begin. i made a variation of these last night they were awesome!!!! Yes! These were amazing. I pretty much made out with my leftover mango. Great, easy recipe. I’m making these for dinner tonight, for the mango salsa, I am using a recipe from a restaurant in Dubai called Zeng He’s. The difference is that they add green peppers, Thai sweet chili sauce, lemon juice and dried kiwi seeds and I am adding some of the chopped coriander directly in the salsa. I can’t wait for dinner, I’m so excited!!! The above mentioned restaurant serves this salsa with deep fried shrimp and wasabi mayo. Its to die for!!!! My hubby and I usually order one pretending that it’ll be enough and always end up re-ordering. YUMMMM!!! P.S. how’s your sun burn? Love when i found recipes with beautiful pictures, I’m ready to make dinner! Found these on Pinterest and made them for dinner last night! They were delicious; extremely flavorful yet quite healthy. The mango salsa was a big hit! PHENOMENAL! We grilled the shrimp and also tossed the tortillas on the grill before assembling them. Thanks! Love love love these!! I have made them once for the boyfriend and tonight for my parents. Least to say, they are a HUGE hit! Thanks so much for the recipe! They are in my long term recipe book for sure!